MANHATTAN (CN) – Wheeled before a judge for the first time, the man accused of turning a Load ’N Go flatbed truck into a weapon of terror on a New York City bike lane made his appearance fresh from Bellevue Hospital on Wednesday. 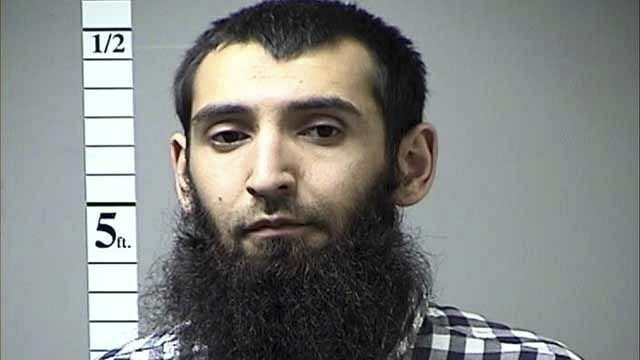 Sayfullo Saipov, 29, spent the previous day killing eight people and injuring 12 on a deadly Halloween ride along Manhattan’s West Side Highway, mowing down civilians along the greenway until the vehicle crashed into a school bus, federal prosecutors say. Unveiling charges that link the attack to the Islamic State group, Manhattan U.S. Attorney Joon Kim called Saipov a “man consumed by hate and a twisted ideology” at a press conference. 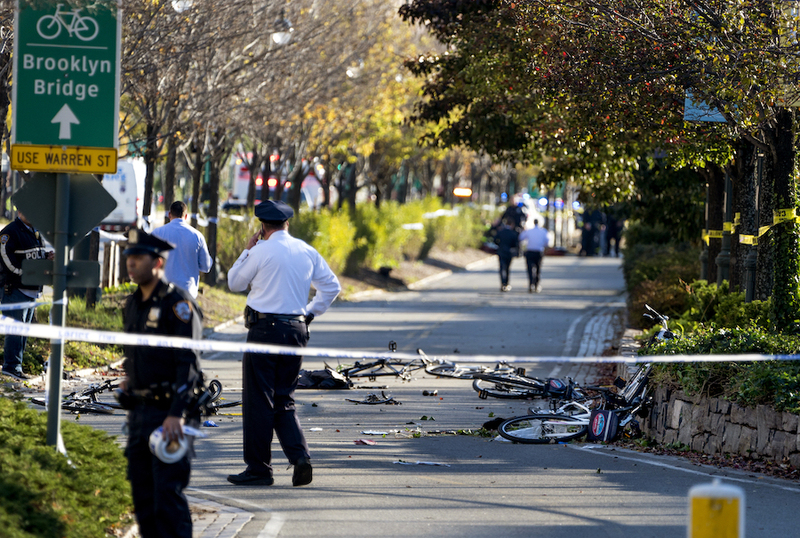 “The man sped down the West Side Highway and then intentionally plowed his truck into a pedestrian walkway and bicycle path, hitting and running over people who were simply trying to enjoy a sunny afternoon in New York City,” Kim said. “Saipov crashed his truck into a school bus carrying children, and then he got out and yelled ‘Allahu Akbar,’ meaning ‘God is Great,’” he added later. 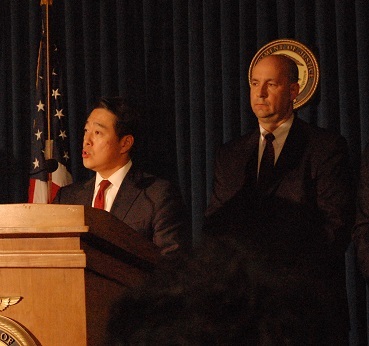 Manhattan U.S. Attorney Joon Kim with FBI Assistant Deputy Bill Sweeney, announcing charges against the man suspected in the New York City truck attack on Tuesday. The immigrant from Uzbekistan originally intended to cause even more carnage, prosecutors say in a 10-page criminal complaint, claiming the original plan was to drive all the way to the Brooklyn Bridge. Shot in the abdomen before being apprehended by the New York City Police Department on Tuesday afternoon, Saipov appeared haggard in his gray shirt and sweatpants as U.S. marshals rolled him into the arraignment room. Handcuffs made it hard from him to raise his right hand when U.S. Magistrate Judge Barbara Moses asked him to swear to the truthfulness of his affidavit, which stated that he could not afford a lawyer. “Is there anything that you’d like to change or add to it?” she asked, referring to the document. With that questioning, Moses affirmed the appointment of Saipov’s attorney David Patton, the head of the Federal Defenders of New York. Saipov listened along to the proceedings via Russian translation through earbuds, and he convened with attorneys as the judge informed him of his Miranda rights. Patton told reporters after the hearing to judge his client’s case through the lens of due process. Transferred to FBI custody at 1:35 p.m. Wednesday, Saipov will now spend his first night in a federal prison. Patton asked the judge to make sure that the suspect receives a daily change of dressing to prevent infection for his wound and be given crutches or a wheelchair to prevent putting weight on his injury. “He is in a significant amount of pain,” he told the judge. Saipov’s speedy hearing along U.S. constitutional principles capped off daylong speculation about the accused terrorist’s destination. President Donald Trump had told reporters hours earlier that he would consider sending Saipov to Guantanamo Bay, even though the Uzbek national is a lawful permanent resident of the United States. Hours later, Manhattan federal prosecutors unsealed a 10-page complaint detailing allegations about Saipov’s ties to the Islamic State group. “In particular, Saipov was motivated to commit the attack after viewing a video in which Abu Bakr al-Baghdadi – who based on my training and experience I understand to be the leader of ISIS – questioned what Muslims in the United States and elsewhere were doing to respond to the killing of Muslims in Iraq,” FBI Agent Amber Tyree says in the complaint. According to the complaint, Saipov told investigators he chose Halloween for his attack to maximize civilian casualties. “Saipov wanted to display ISIS flags in the front and back of the truck during the attack, but decided against it because he did not want to draw attention to himself,” the complaint states. Prosecutors say authorities found 90 videos and 3,800 images on Saipov’s cellphone, including footage of a beheading and executions and images from a propaganda wing of ISIS. NYPD Deputy Commissioner of Intelligence and Counterterrorism John Miller told reporters that the search of Saipov’s two cellphones is still in progress. “We don’t know his path of radicalization yet,” Miller said. Both cellphones were found on the floor of the truck Saipov was driving, along with a stun gun and a document with Arabic and English text stating “It will endure,” a slogan associated with the Islamic State group. Also recovered from the scene was a black bag containing three knives and a wallet with Saipov’s Florida driver’s license. The New York Times reported on a second man the FBI is seeking in connection with the attack, Mukhammadzoir Kadirov, though little is known at this time about why authorities want to question him. Bill Sweeney, assistant deputy in the FBI’s New York Field Office, also emphasized the investigation will take time to complete its course. Donna Lieberman, executive director of the New York Civil Liberties Union, emphasized that the government has a duty to uphold the Constitution while this investigation is pending. Tuesday’s attack has been called New York’s deadliest terrorist attack since Sept. 11, 2001. More than 17 years later, five men accused of plotting those attacks are still far away from a trial at their military commissions at Guantanamo Bay, where the war court has stalled in preliminary proceedings.